Do you remember that cute little nursery rhyme about those little monkeys jumping on the bed? What started off as just one little monkey jumping on the bed quickly multiplied into multiple little monkeys with some bad concussions. Why exactly is that? Well, no one did anything to stop them! If EcoTech had seen these little monkeys jumping, we would have immediately stopped them! No more monkeys jumping on the bed! In a similar way, that’s what we try to teach our clients every day. When you see a pest or animal in your home, it’s likely that it is not the first and it will not be the last, unless you put an end to it then. EcoTech is a Minneapolis, MN company that covers both pest damage repair and animal damage repair. When disaster strikes, we help patch it up. The ants may come marching in one by one, but they end up multiplying in to the thousands! Pests like ants, beetles, spiders, etc., will not magically go away on their own and exterminating one does not mean that the others will take a hint and skedaddle. No! They are here to stay unless you can do something to prevent them from coming back. Eco Tech can help with this tremendously. Don’t let your problem multiply, so call us today and let us take care of the issue right away. 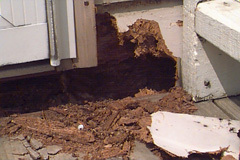 Not only will we get rid of the pests, we will then perform pest damage repair. This means that whatever damage they caused while in your home will be fixed, including the entry points by which they were able to get into your property in the first place. Very similar to pest damage repair, we will take those extra measures to ensure that once the animal, or animals, are out of the home, animal damage repair is done to ensure no re-entry. We handle the problem from start to finish so that you can finally have some peace of mind. Our easiest example of animal damage repair would have to be your dreaded bats. If bats are left alone in your home or attic, they will eventually multiply. Once we humanely get rid of these bats, we will reinforce the areas that attracted bats into your home in the first place. This will eliminate the chance of them coming back and we are so confident in our services that we back all of our work with a four-year warranty. If you are looking for an environmentally friendly and efficient pest damage repair company in Minneapolis, Minnesota, look no further than EcoTech. For more information, call us today at 763-785-1414.